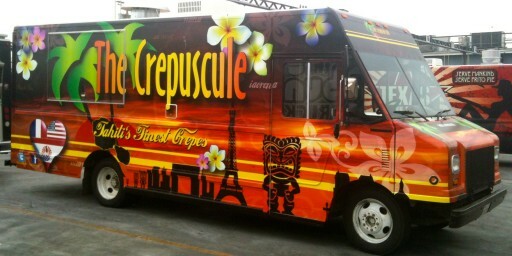 The Crepuscule is just about ready to hit LA with their sweet and savory crepes, done the Tahitian way by a couple of really nice French guys! It doesn’t get anymore authentic than this. Keep an eye out for the truck with a Tiki statue standing next to the Eiffel Tower. Their page has more info + menu details. Welcome to LA Dom & Mat! We are now anticipating meeting up with you and your yummy truck. They have fantastic food, good prices, definitely worth it.